Around 1740, the German sculptor, Johann Joachim Kaendler, master model maker of the Meissen porcelain factory in Germany, was commissioned to create a curious series of sculptures. 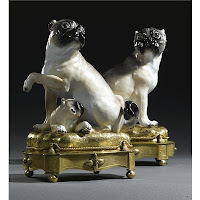 They were a group of porcelain Pug dogs designed as secret emblems for a German underground Masonic-styled lodge known as the "Order of the Pug." 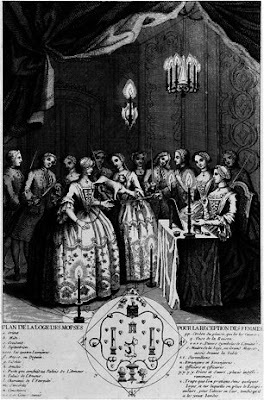 According to an exposure published in 1745 in Amsterdam, L’ordre des Franc-Macons trahi et le Secret des Mopses rélélé, the Order of the Pugs was likely designed as a fraternal group for Roman Catholics who had been forbidden to join the Masons by Pope Clement XII 's 1738 bull, In Eminenti Apostolatus Specula. It is believed to have been started in Bavaria by the elector of Cologne, Clemens August of Wittelsbach. According to the exposure, the members called themselves Pugs. Initiates were required to wear a dog collar, and gained entrance to the lodge by scratching at the door. Initiates were hoodwinked and led around a symbol-filled carpet nine times while the assembled "Pugs" of the Order barked loudly and yelled “Memento mori” ('Remember you shall die'). The blind candidate was required to kiss the Grand Pug's backside under his tail as an expression of total devotion (in reality, a porcelain pug dog). 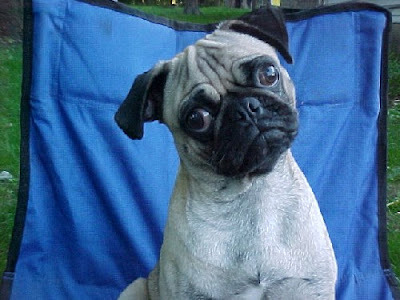 The pug was chosen as a symbol of loyalty, trustworthiness and steadiness. All members had to be Roman-Catholics, and the Order of the Pug allowed women as members. The Grand Master was a man, but each lodge required two lodge masters or Big Pugs, one man and one woman, who shared the governing role. Apparently, the Pug became something of a subversive emblem of the Enlightenment, and England in particular. Pug dogs came to England with King William III when he was brought from the Netherlands in 1688 by Parliament to replace his uncle and way-too-Catholic father-in-law, James II, who was booted out of Blighty. This "Glorious Revolution" created a constitutional monarchy that was watched over carefully by Parliament. Europe’s intellectuals began to admire this new style of English government and free thinking, and owning a Pug was a subtle way of showing solidarity with England's revolution without getting locked in the stocks or hurled into a dungeon. In Paris, Pugs became associated with Voltaire and Diderot. The Order of the Pugs was outlawed in 1748. How could anyone outlaw that face? Fascinating. This is a piece of Masonic history that I was unaware of. Thank you for sharing it with us. Hi Chris, You beat me to it...I came across a Mopses display recently at the Grand Lodge of England (http://www.ugle.org.uk/ugle/library.htm) and, as a pug owner, was doing some research for a post about them on our own blog at the National Heritage Museum (http://nationalheritagemuseum.typepad.com/library_and_archives/). Look up all the celebrity photos with pugs. A bunch of the hollywood "sacrificed" stars have photos with pugs and a lot of hollywood own pugs. So is The Order Of The Pugs really still in existence or is that all a big coincidence? Queenan: "Enough With The Sweet Talk"
William Morgan: "The Bright Mason"
Looking for a Lodge Goat?